Mostra i dati della tua stazione meteo Netatmo sul tuo sito Joomla. Con Digi Netatmo puoi integrare Joomla e Netatmo facilmente, in modo da mostrare sul tuo sito web i dati proventienti dalla tua stazione meteo Netatmo. Questo avviene tramite le API Netatmo integrate nel modulo Joomla in modo da consentirti facilmente di impostare quali dati vuoi visualizzare ed in che modo. Questo è il primo modulo Joomla Netatmo che può essere utile ogni volta che sia necessario mostrare su Joomla previsioni meteo in tempo reale: piste da sci, hotel, bed & breakfast, noleggio barche, maneggio, attività all'aperto, sono solo alcuni esempi di siti web che potrebbero richiedere di far vedere ai visitatori il meteo in tempo reale. La configurazione è semplicissima, dopo aver inserito i propri dati dell'account Netatmo, si potrà selezionare la stazione meteo Netatmo, i relativi moduli esterni ed in seguito i dati da visualizzare. Altre ozioni secondarie sono disponibili, come la visualizzazione slide show ed il backup della configurazione modulo da back end. A causa della compatibilità delle API Netatmo, questo modulo non può funzionare con PHP > 7.0.28. Ottieni più informazioni qui. Porta il tuo sito Joomla sul nuovo livello dell'internet of things! This module is very easy to configure. First you have to enter your Netatmo username and password (the same you use on the smartphone app to control your weather station) in the proper fields, then save the module. If the Netatmo login data is correct, you can see the weather stations drop down menu filled by your station(s). Now select the weather station (this is the station that sends data to the Joomla module). Click the save button on the left of the field. If you have external modules, such as rain or wind meters, you can now select them from the multi select field, then click the save button on the left of the field. Now, in the weather data multi select field, you have all the showable data. Select which data you want to show and then save the module. You will see the selected data in the front end of your website. Other options are: display type (can be text or slideshow), show date and time (with selectable date format), display units of measures, selectable temperature scale (Celsius, Fahrenheit, Kelvin), selectable length scale (mm, inches), selectable speed scale (kph, mph), display wind direction (cardinal points or degrees), show weather station name and many more. If you want to use slideshow display mode, and something doesn't run properly, maybe you can have some jQuery errors and/or conflicts. So in the advanced settings tab of the module, you can include or not the jQuery library, and you can choose to use the jQuery No Conflicts mode. You can check the status of your station and modules directly in the module backend, under "Service data" tab. Here you can take a look to all batteries level, to Wi-Fi signal strength, to modules signal strangth and to modules firmware. Is this module compatible with all weather stations? This module is compatible with all weather stations and sub-modules made by Netatmo. Other brands weather stations are not supported. Can I display the data of a weather module linked to my weather station? Of course yes! You can display data coming from the external module, rain module, wind module, and other internal modules if you want. Is it hard to configure this module? No, is not hard. Just put your Netatmo username and password in the proper fields, save, then select the station and modules you want as source for the data, and select the data to display (depending of your module availability). That's is, so easy. Can I use my own Netatmo App data? Yes, you can by selecting the proper option in the back end of the module. After, enter your Cliend ID and Client Secret in the proper fields. 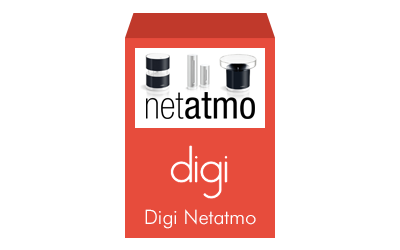 How I can try to match the design of Digi Netatmo with my Joomla! template? If you are not satisfied from the design of our module, you can easly change the style by css. Each div and container has the proper ID or class, even every weather data container has one different from the others; for example the temperature container will have the class "temperature". Can I connect the module with a weather station in another part of the world? Sure, you can if the Netatmo weather station is associated to your Netatmo account. Perfect integration for Netatmo to Joomla. Functionality: It runs properly. Easy to use and to configure. Ease of use: Easy to configure. I entered my Netatmo data and the module shows me my Netatmo weather stations. I selected the data to display. Finish. Support: I did not need support for now. Thanks anyway. Documentation: I read documentation on the developer website on the product page. The module is very easy to use but I have read doc to be sure. Value for money: It does not cost a lot. The price is ok. I used this to: I use to display weather data on a website of my customer who has an hotel with a swimming pool and he wants to shows to customers the real weather data, temperature, rain, wind, humidity.